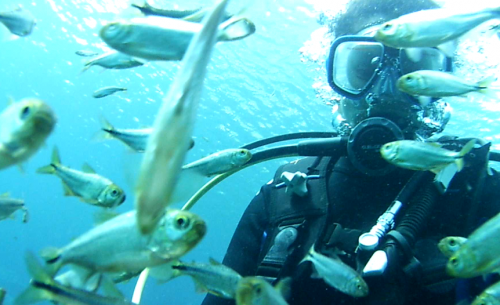 On this windy chilly day Wiles brought divers here from Fort Bliss for scuba certification. “This is the cienega – is the swamp – the pond out front – swamp – desert marshland – people are not allowed in any of this water. That is the main habitat of the Comanche Springs Pupfish and the Pecos Gambusia – the pup fish lay their eggs in these shallow areas – so do the phantom cave and phantom spring snails. We don’t disturb them,” she said. Morrison explains things slow down during the winter but when summer comes the parks gets busy with thousands of visitors a day seeking out the cool clear water. “And once the water goes through the park – flows through the park it irrigates approximately seven to eight thousand acres of farmland in the area mainly alfalfa and cotton,” said Morrison. The town has a population of about 500 people. It’s about 130 miles Southwest of Midland. This town and area farmers depend on the waters of the San Solomon Springs and on this this Saturday many of the area residents are gathering to figure out a way to save their springs. They are concerned about the recent discovery of a massive petroleum deposit in the area called Alpine High. Houston Based Apache Corporation has announced plans to drill for the oil and natural gas around Balmorhea. John Sharp, a UT professor of Geology, says there’s evidence that development could pollute or end of the flow of the springs. “We in Texas as used to oil and gas. And we are people and contamination accompanies what people do. And they’re very concerned about this. They don’t want the springs to cease to flow and they want the water quality to remain good – and I think that’s fair,” said Sharp. Sharp was invited to come to Balmorhea to explain how the springs work – where does the water come from and how vulnerable they are if oil field fracking begins in the area. “San Solomon Springs has been amazingly resilient. It’s dropped a little bit but it’s still flowing fairly consistently but if there is intensive water use this could change. But if there is intensive water use this could change. They need to be proactive. They need to see what development can be gone without affecting the spring,” he said. “People are worried – people are afraid,” said Trey Gerfers, board president of the Big Bend Conservation Alliance. 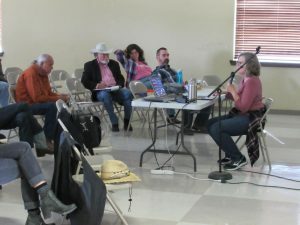 He said residents are conflicted over the issue of protecting the springs because so many of them have a connection to the oil industry. “Many people derive income from that industry. What our objective is with this meeting is with this meeting is to have people come and get information and learn about what are the potentials – what could possibly happen,” said Gerfers. A report from the environmental group Earthworks builds a case that oil activity could pollute or disrupt the springs in number of ways. “There’s extensive fault systems out here and that creates a pathway of fracking chemicals,” said Sharron Wilson, an organizer with Earthworks. Those chemicals are highly toxic – even in small amounts. That could threaten the endangered species that inhabit the springs. There’s some hope that the protection for these rare creatures could be used in a federal court battle to save the springs. But local resident Dave Espy says he can’t understand why the springs are being put at risk to begin with. Espy made protecting the springs central to his campaign for County Commissioner for Reeves County. He says there’s plenty of oil in the world today – there’s only one San Solomon Springs. However, others in the community welcome the boom and jobs that the oil development will bring. Espy, a Republican, lost his campaign for commissioner. The Apache Corporation decline to be interviewed for this story but they released a statement saying they understood the concerns of the residents but they are taking steps to protect the town and the springs from oil development activity. Apache is also working with UT Arlington to conduct an independent water study. 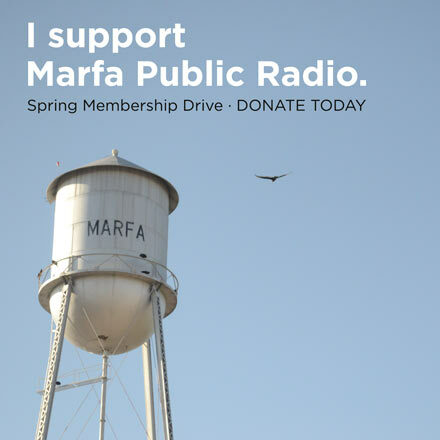 – David Martin Davies, Texas Public Radio. This story originally appeared here. Read more about how Apache Corporation previously responded to concerns about possible environmental damage from the Alpine High oilfield discovery here. This entry was posted in KRTS News and tagged Alpine High Oilfield, Apache Corporation, balmorhea, Energy, Environment, Oil and Gas, San Solomon Springs, Texas Public Radio. Bookmark the permalink.